This article will discuss some of the most popular options for pickup truck tires that perform exceptionally well in the snow. . If you live in a region where roads disappear under snow and ice for weeks at a time, you know that snow tires are necessary for maximum ice grip. Cold weather tires are especially configured to grip slick, icy roads. Although there are other strong candidates, experts contend that Bridgestone, Michelin, and Firestone make the best tires for cold weather climates. Snow and ice can prove a hazard for trucks using all-season tires, but the Bridgestone Blizzak DM-V1 plows smoothly through blizzards. Owners say these Bridgestone tires offer a smooth, quiet ride, and many drivers are fiercely loyal to the brand. Note that these tires do not carry a tread warranty; that said, most experts maintain that this is a durable winter tire. Blizzard DM-Z3 tires feature Bridgestone’s patented Link Multicell Compound, which help prevent your truck from skidding or slipping by dispersing the surface water that sits on top of ice. The first 55 percent of tread depth of each tire is laced with a fiberglass substance. 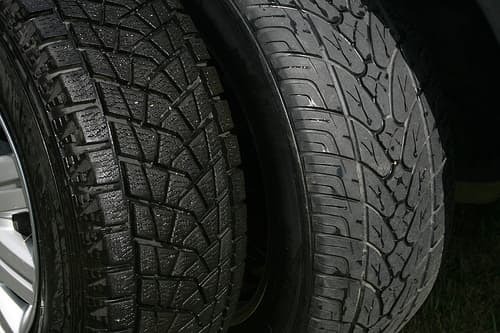 As a result, these tires provide excellent traction for your truck in even under the slickest of conditions. Like Bridgestone, Michelin has a compound that helps increase traction in winter driving conditions. Michelin Latitude Alpin HP tires feature a rubber compound that is infused into each tire. The substance keeps its flexibility even in very cold weather. This enables the proper traction during icy and snowy conditions. Firestone’s Winterforce snow tires are also a good option for pickups. The tires are available with or without studs and they have a directional tread pattern comprised of numerous, independent tread blocks. The blocks are tough and rigid and made for navigating in loose snow. While most pickups are very maneuverable, the toughest vehicle has trouble navigating in extreme winter weather without appropriate cold weather tires. Snow tires can help increase your truck’s grip on roads that are snowy, icy, and slippery. The companies Bridgestone, Michelin, and Firestone make some of the best-rated truck snow tires on the market.